I have been using this product for almost 2 years now and I will never use anything else. It perfectly tames my curls into lovely waves with no frizz without weighing down my hair. J’adore !!! This is the best hair styling cream and my favourite. It protects hair from heat, controls frizz, tames down hair if you want to go for a sleek bun look and, makes hair shiny. Basically, if you need one hair styling product this is it! 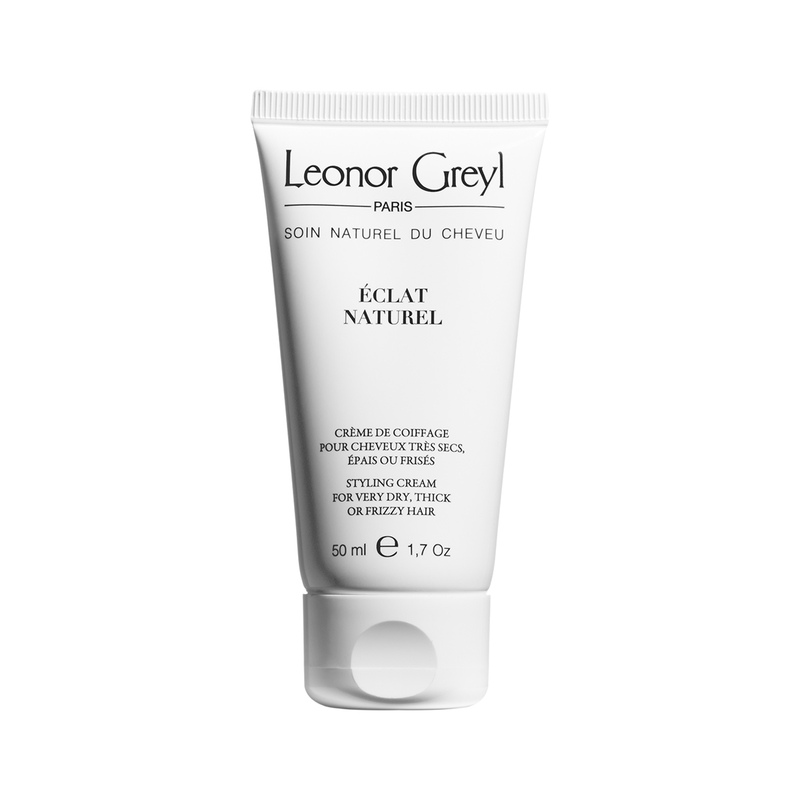 I have been using Leonor Greyl products exclusively for the past 2 years and Eclat Naturel is the one I couldn’t live without. It shapes my hair without hardening, manages flyaway without a greasy residue. You can still run your fingers through your hair (or let someone else do it). In short, a remarkable product. I tried this as a sample, and it fixed my frizzy fly aways. It smelled awesome as well. I plan on buying the full bottle to get a better sense of the product. I have used Leonor Greyl products exclusively for the past 18 months and never looked back. My hair never looked better. Of all products Eclat Naturel is the one I wouldn’t live without. It makes my hair manageable, shiny, tames flyaways, yet leaves it soft to the touch. If I had one wish it is that the fragrances of different products relate one to the other, or at least in the same fragrance family- such as citrus. Little to ask for otherwise outstanding products! I have wavy highlighted hair and this product makes my hair look healthy. A must try! Tried this as part of the luxury sample pack. My hair felt nice after using it & I’m considering buying the full size. A little of this product goes a long way. It smells wonderful – a clan, fresh, citrus scent. If I use too much it makes my blond hair look greasy. It is perfect for taming little “fly-away” hairs and hydrating dry ends. This cream is like nothing else I’ve ever tried. It makes my hair smooth, no frizzies, manageable, adds body, and absolutely gorgeous. I’ll use it forever. Never tryed. Do you have any samples? I have curly and color treated hair and this product works very well for me! I would strongly recommend Eclat Naturel for anyone who wants to have shiny and healthy looking hair. I adore this product! Due to constantly coloring my hair had turned to straw at the ends and after ordering the sample set I pre-shampooed with the oil and air dried with eclat naturel. NOTHING has left my hair so soft and non frizzied plus it smells really nice. I used to be a Carol’s Daughter or Redken chic but totally converted to Leonor Greyl…can’t deny the french know what they’re doing. I recently purchased Éclat Naturel and I love it! My hair are thin, so I was a bit cautious thinking that it might just way my hair more down, but instead it gave it a nice shine and definition . Defenetly recommend it and will buy more! Eclat Naturel is a go to styling product! I use this after using any of my curling work… This product helps to add moisture while breaking down some of the set work so it becomes more wave. This cream gives a wonderful sheen and separation. Amazing product! Extremely light weight and easy to use. Smells great! I use this everyday on wet or dry hair. Makes my long, dry hair more manageable and gives it nice texture! And the smell is AMAZING! Great styling product – the scent is amazing – but less is more with this one! Start with a very small amount and build from there. A little goes a long way. It’s super rich, and great for texturizing, smoothing or curls. My must have! My husband steals it all the time too! I started using Lait Luminescence and it is insanely fabulous! I also cocktailed Eclat Naturel with Serum de Soie Sublimateur and my hair is totally awesome! I always use the Palm Oil before I shampoo. This line is truly the best hair line on the market! This product has been so great for my curly, curly out of control hair! My hair has always been pretty healthy, but hard to manage. I love this styling cream because it makes my life a lot easier! I put a little cream on my hair, scrunch it and I’m good to go! And I can use it when I want to take more time and go straight. Totally recommend it! Great product for super dry hair. I spend most of the day out in the sun and it shows in my hair. When I starting using it I noticed a big difference in the look and feel of my hair, and I love that it has sun protection in it. Even though I have my own product line I find Leonor Greyl to be the perfect compliment. My favorite products are Eclat Naturel, Mousse au Lotus Volumatrice and Huile de Palme. Start with small amount (pea size) and use more if needed. Apply to damp or dry hair to help detangle and sculpt hair. The hair can be shaped with fingertips, scrunch for curly styles or smoothed down for a straight look. Formulated in 1987 to tackle the needs of very dry and difficult to manage hair, Éclat Naturel is both a texturizing cream to tame unruly hair, and a rich treatment to nourish and visibly improve hair texture. While other products at the time were opting for silicones to add gloss and slip, Mr. Greyl focused on natural oils and Shea butter for their taming, ultranourishing properties. The styling hair CARE was born. An essential product for frizzy or very dry hair at home, it also became a salon must-have, winning multiple industry awards around the world.